Affordable luxury has a new destination in the city as Navin’s, Chennai’s most trusted developer for over 25 years, today announced the launch of its Starwood Towers 2.0 project at the burgeoning micro-market, Medavakkam. A landmark smart mini-township project at Vengaivasal with over 400 smart homes offers an upscale lifestyle to home buyers with thoughtful technology and world-class amenities starting from an all inclusive pocket friendly price of Rs. 34 lakhs for compact 2 BHK. A first in Chennai’s realty market, Navin’s is set to redefine the affordable home space by integrating opulent lifestyle in its smart, safe, spacious and serene homes. Powered with technological intelligence, and many click to control home facilities, the project is a Wi-Fi enabled community that offers premium features like biometric PINS, smart phone door locking, light & fan control at every home. Developed with MIVAN technology framework, each home has been designed to offer unshakable strength, safety and durability. Navin’s Starwood Towers 2.0 with masterful planning uses support of MIVAN technology to offer spacious homes with higher carpet area. Other premium lifestyle amenities of the project include a sprawling 40,000 sq.ft podium around the structure, long walking trail, grid system lightning arrestor, fire sprinklers, snorkel driveway in case of emergency and toughened glass to further enhance safety of the residents. The project is also fully equipped with sensor lighting and solar energy supply throughout the common areas. A striking feature of the project is that it one of Chennai’s first pre-certified IGBC gold rated ‘Green Building’. 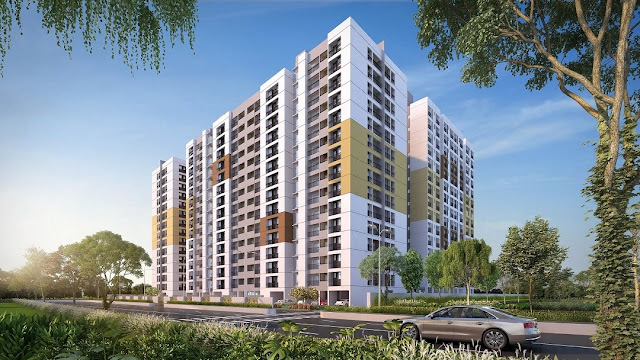 The project consists of three blocks of 2BHK, 2.5 BHK and 3 BHK homes. These housing blocks, the club house and a large part of the podium are under construction. ‘Pine’ block housing compact 2 BHK covers 591 sq.ft to 601 sq.ft, the ‘Redwood’ and ‘Oak’ blocks comprising of 2BHK, 2.5 BHK and 3 BHK covers 1234 sq.ft, 1371 sq.ft and 1469 sq.ft and 1484 sq.ft respectively. Navin’s believe that building homes is an art, and an exercise of intellect, careful precision, and passion. Since 1989, the motto of the organization has been to achieve the culmination of architectural brilliance and value-for-price in the projects. Over 110+ projects dot Chennai's skyline that stand testimony to a passion called Navin’s; and the long journey that intertwines a cherished dream - to be the most trusted builder. The organization was the first in Chennai to receive the ISO 9001-2008 Certification and bring to the table, clear titles, excellent locations, quality products, perfect constructions, strict adherence to rules and regulations, care for customer needs, and above all, ethical business practices.